کرد مصطفی پور, فردوس, بذرافشان, ادریس, اسکندری, آمنه, اکبری, حمیده. (1394). بررسی حذف رنگ بازی قرمز 18 با استفاده از بیوفیلم تشکیل شده بر بسترگرانول باگاس در راکتور هوازی پیوسته. مجله آب و فاضلاب, 26(5), 84-91. فردوس کرد مصطفی پور; ادریس بذرافشان; آمنه اسکندری; حمیده اکبری. "بررسی حذف رنگ بازی قرمز 18 با استفاده از بیوفیلم تشکیل شده بر بسترگرانول باگاس در راکتور هوازی پیوسته". مجله آب و فاضلاب, 26, 5, 1394, 84-91. کرد مصطفی پور, فردوس, بذرافشان, ادریس, اسکندری, آمنه, اکبری, حمیده. (1394). 'بررسی حذف رنگ بازی قرمز 18 با استفاده از بیوفیلم تشکیل شده بر بسترگرانول باگاس در راکتور هوازی پیوسته', مجله آب و فاضلاب, 26(5), pp. 84-91. کرد مصطفی پور, فردوس, بذرافشان, ادریس, اسکندری, آمنه, اکبری, حمیده. بررسی حذف رنگ بازی قرمز 18 با استفاده از بیوفیلم تشکیل شده بر بسترگرانول باگاس در راکتور هوازی پیوسته. مجله آب و فاضلاب, 1394; 26(5): 84-91. رنگ‌ها یکی از مهم‌ترین آلاینده‌های موجود در فاضلاب صنایع نساجی بوده و غالباً سمی، سرطان زا، جهش‌زا و غیر قابل تجزیه بیولوژیک هستند. این مطالعه با هدف بررسی کارایی حذف رنگ بازی قرمز 18 با استفاده از بیوفیلم تشکیل شده بر بستر گرانول باگاس در راکتور هوازی پیوسته انجام پذیرفت. این مطالعه از نوع تجربی- آزمایشگاهی بود که اثر متغیرهای غلظت رنگ (200 تا 30 میلی‌گرم در لیتر)، زمان ماند هیدرولیکی (8 تا 2 ساعت)، غلظتBOD 100 تا 200 میلی‌گرم در لیتر بر کارایی حذف رنگ بازی قرمز 18 و همچنین ضرایب سینتیکی در راکتور هوازی بررسی شد. نتایج نشان داد که حداکثر کارایی حذف رنگ در غلظت اولیه 30 میلی‌گرم در لیتر برابر 90 درصد در زمان ماند هیدرولیکی 8 ساعت بود که در BOD ورودی 200 میلی‌گرم در لیتر کارایی حذف رنگ برابر 86 درصد به‌دست آمد. ضریب حداکثر سرعت مصرف سوبسترا (K) در بار آلی BOD مساوی 100 و 200 میلی‌گرم در لیتر به‌ترتیب 23/0 و 41/1، ثابت نیم سرعت واکنش (Ks) در بار آلی BOD مساوی 100 و 200 میلی‌گرم در لیتر به‌ترتیب برابر 85/44 و 39/19 به‌دست آمد. همچنین ضرایب خودتخریبی (Kd) در BOD ورودی مساوی 100 و 200 میلی‌گرم در لیتر به‌ترتیب برابر 35/0، 5/0 و ضریب حداکثر سرعت ویژه رشد توده زیستی (mµ) به‌ترتیب برابر 36/83 و 37/4 محاسبه شد. نتایج این مطالعه نشان داد که بیوفیلم تشکیل شده بر بستر گرانول باگاس در راکتور هوازی پیوسته، کارایی خوبی در حذف رنگ بازی قرمز 18 دارد. Dyes comprising a major pollutant in the effluent from textile plants are mostly toxic, carcinogenic, mutagenic, and non-biodegradable. This experimental-laboratory study was carried out using a biofilm formed on a granular bagass bed in a continuous aerobic reactor to investigate the kinetic coefficients of the aerobic reactor as well as the effects of color concentration (30-200 mg/l), hydraulic retention time (2-8 h), and BOD concentration (200-100 mg /l) on the removal of Basic Red (18) from textile effluents. The results revealed a maximum removal efficiency of 90% for an initial color concentration of 30 mg/l and a hydraulic retention time of 8 hours. A color removal efficiency of 86% was recorded for an influent BOD concentration of 200 mg/l. Also, maximum substrate utilization rate (K) for organic loadings of 100 and 200 mg/L were 0.23 and 1.41 while the half velocity constant values were 44.85 and 19.39, respectively. Moreover, for the same organic loadings, the values of 0.35 and 0.5 were recorded for decay coefficient (Kd) and 37.36, 4.83 for maximum specific growth rate coefficient (μm), respectively. Based on the findings of this study, it may be claimed that the biofilm formed on a granular bagass bed in a continuous aerobic reactor has a good Basic Red (18) removal efficiency. 3. Dalvand, A., Gholami, M., Joneidi, A., and Mahmoodi, M. (2009). Investigation of electrochemical coagulation process efficiency for removal of reactive red 198 from colored wastewater.” J. of Color Science and Technology, 3, 97-105. 5. Vasileia, M., Daskalaki, E. S., Timotheatou, A. K., and Dimitrios, K. (2011). “Degradation of reactive red 120 using hydrogen peroxide in subcritical water.” Desalination, 274, 200-205. 6. Tehrani-bagha, A.R., and Amini, F.L. (2010). “Decolorization of wastewater containing C.L. reactive red 120 by UV- enhanced ozonation.” J. of Color Science and Technology, 4, 151-160. 7. Alanur, O. M., Yavuz, H.I., and Erbatur, O. (2004). “Comparsion of several advanced oxidation processes for the decolorization of reactive red 120 azo dye in aqueous solution.” Hazardous Materials, 109, 85-93. 9. Hameed, B.H., Ahmad, A.A., and Aziz, N. (2009). “Adsorption of reactive dye on palm-oil industry waste: Equilibrium, Kinetic and thermodynamic studies.” Desalination, 247(1-3), 551-560. 10. Absalan, Gh., Asadi, M., Kamran, S., Sheikhian, L., and Goltz, D.M. (2011). “Removal of reactive red-120 and 4-(2-Pyridylazo) resorcinol from aqueous samples by Fe3O4 magnetic nanoparticles using Ionic liquid as Modifier.” J. of Hazardous Materrials, 192, 476-484. 11. Asilian, H., Moussavi, G.R., and Mahmoudi, M. (2010). “Adsorption of reactive red 198 azo dye from aaqueous solution onto the waste coagulation sludge of the water ttreatment plant.” Health and Environ Journal, 3(1), 93-102. 13. Daneshvar, N., Kataee, A., Rasoulifard, M.H., and Seyed Dorraji, M. (2007). “Removal of organic dyes from industrial wastewater using UV/H2O2, UV/H2O2/Fe(II),UV/H2O2/Fe(III) processes.” J. Water and Wastewater,18-1(61), 34-42. 14. Maleki, A., and Rezaee, R. (2009). “Toxicity reduction of reactive black 5 and disperse orang 25 by advanced oxidation processes.” J. of Color Science and Technology, 3, 17-23. 15. Noohi, A., Emtiazjoo, M., and Ordoozadeh, N., (2008). “Decolorization of reactive black by local types separated from Tehran textile factories.” J. of Science and Technology, 10(1), 19-27. 16. 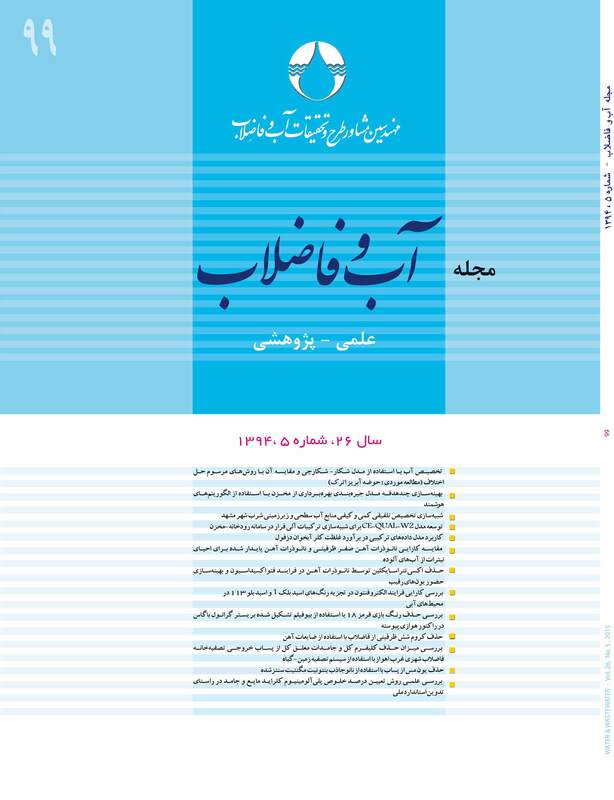 Emami, F., Tehrani-bagha, A.R., and Gharanjig, K. (2010). “Influence of operational parameters on the decolorization of an azo reactive dye (C.I. reactive red120) by fenton process.” J. of Color Science and Technology, 4, 105-114. 17. Ghanizadeh, G., and Asgari, G., (2009). “Removal of methylene blue dye from synthetic wastewater with bone char.” Iran. J. Health and Environ., 2(2), 104-113. 18. Mahvi, A.H., Ghanbarian, M., Naddafi, K., and Mahmoodi, N.M., (2007). “Investigation of the toxicity reduction in reactive dye solution and real textile wastewater by nanophotocatalysis process using daphnia.” J. of Color Science and Technology, 1, 91-96. 19. Ghaneian, M.T., Ghanizadeh, G., Gholami, M., and Ghaderinasab, F. (2009). “Application of eggshell as a natural sorbent for the removal of reactive red 123 dye from synthetic textile wastewater.” Tabib Shargh, 11(4), 25-34. 20. Hamdi-Karaoglu, M., Dogan, M., and Alkan, M. (2009). “Removal of cation dyes by kaolinite.” J. of Microporous and Mesoporous Materials, 122(1-3), 20-27. 21. Rehm, H., and Reed, G. (1999). Biotechnology, 2nd Ed., Vol 11a. Wiey-VCH; Germany. 22. Nail, R.V., and Gaikwad, R.W. (2001). “Powdered activated carbon assisted biodegradation.” J. of Industrial Pollution Control, 17(1), 99-106. 23. Frasnson, M. (1999). “Pact system for difficult wastewaters.” Hydrocarbon processing, 78(12), 8-16. 24. Plattes, M., Henry, E., Schosseler, P., and Weidenhaupt, A. (2009). “Modeling and dynamic simulation of a moving bed bioreactor for the treatment of municipal wastewater.” Biochemical Engineering Journal, 32(2), 61-68. 25. Lin, Y. (2009). “Kinetics of nitrogen and carbon removal in a moving fixed bed biofilm reactor.” Applied Mathematical Modeling, 32 (11), 2360-2377. 26. Borghei, S., Sharbatmaleki, M., Pourrezaie, P., and Borghei, G. (2009). “Kinetics of organic removal in fixed-bed aerobic biological reactor.” Bioresource Technology, 99 (5), 1118-1124. 27. Bajaj, M., Gallert C., and Winter, J. (2008). “Biodegradation of high phenol containing synthetic wastewater by an aerobic fixed bed reactor.” Bioresource Technology, 99(17), 8367-8381. 30. Tchobanoglous, G., Burton, F.L., and Stensel, H. D. (2003). Wastewater engineering: Tretment, disposal, reuse, 4th Ed., Tata McGraw-Hill, New Delhi. 32. Borghei, M., Hassani, A.H., and Sharifi, R. (2010). “Survey of efficiency of biological treatment system with moving bed (MBBR) in textile wastewater treatment.” J. of Science and Technology, 13(1), 13-26. 33. Farzadkia, M., Rezai Kalantari, R., Moussavi, G.H., Jorfi, S., and Gholami, M. (2009). “Comparison of performance of activated sludge with fixed bed and conventional activated sludge in treatment of industrial effluents containing propylene glycume.” J. of Science and Technology, 11(2), 98. 35.Kavoosi, A., and Borgheei, M. (2005). “The use of light expanded clay aggregates as a biological support in wastewater treatment.” Environmental Sciences, 8, 29-42. 36. Alizadeh, R., and Borghei, S.M. (2005). “Using of granular activated carbon in biocarbon process for organic matter and dye removal from textile industries effluents.” Chemistry and Iranian Chemistry Engineering Journal, 25(3), 21-29.